Four large donors to the American Phoenix Foundation, which has been secretly recording Texas lawmakers, are well-known backers of conservative causes. 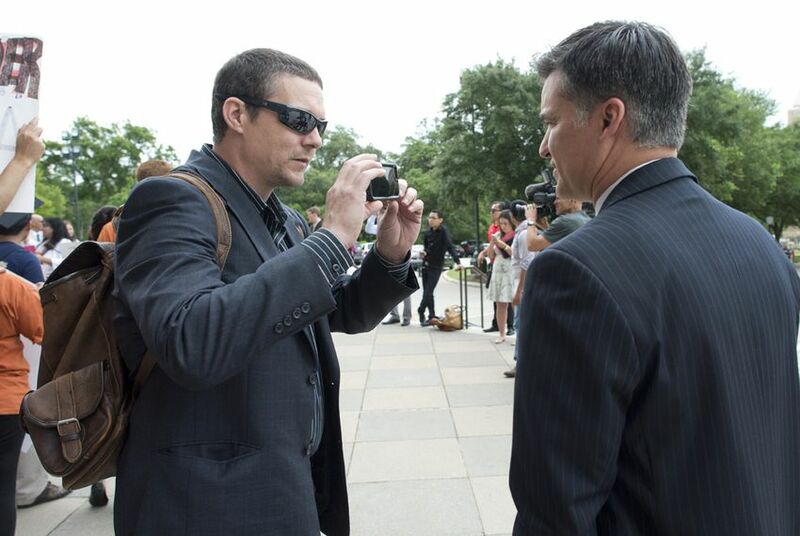 The activist group employing people who have been secretly recording lawmakers has talked about having a bipartisan mission to root out misdeeds of lawmakers no matter the political stripe. But four large donors to the American Phoenix Foundation — the Strake Foundation, the State Policy Network, the Franklin Center for Government and Public Integrity, and Jeff Sandefer's Ed Foundation — are well-known backers of conservative causes. The donations show what many had suspected — that money was coming in from institutional organizations active in other conservative causes. The Strake Foundation, headed by Republican stalwart George Strake, has given $30,000 to American Phoenix since the group's founding in 2010, according to IRS filings with Guidestar.org. Sandefer, a former higher education adviser to Rick Perry, has given a total of $200,000 through his foundation. The Arlington, Va.-based State Policy Network donated $25,000 to American Phoenix in 2012, and the Franklin Center gave at least $25,000 to the group that same year. In the fiscal year ending Aug. 31, 2012, American Phoenix reported donations and grants totaling $182,225. IRS rules do not require the Austin-based nonprofit to reveal individual donors. The four groups "did not donate to this project or to this year's budget at all," a man who identified himself as John Beria, a spokesman for American Phoenix, said in an email Thursday. He added that American Phoenix remains committed to targeting misdeeds by lawmakers from any party. American Phoenix's activities were revealed a few weeks ago after Texas Department of Public Safety troopers, who work in the Capitol as security, discovered what they were doing. Breitbart Texas, a conservative news organization, confirmed to The Texas Tribune more than a week ago that it has a copy of American Phoenix's lawmaker watching project: 836 hours of video. Breitbart Texas' managing director, Brandon Darby, has said his news organization will go through the footage and release it after the legislative session has ended. American Phoenix is headed by Joseph Basel, who in 2010 was among four people who were arrested and charged with entering federal property under false pretenses in Louisiana. The group, pretending to be telephone repairmen, entered then-U.S. Sen. Mary Landrieu's office in New Orleans. Basel later pleaded guilty to a misdemeanor and was ordered to pay a $1,500 fine, serve two years' probation and perform 75 hours of community service. One of his co-defendants in that case, Stan Dai, is also an officer with American Phoenix. George Strake, who served as former Texas secretary of state under Gov. Bill Clements, told the Tribune that his foundation contributed to American Phoenix because he's a fan of the group's vice president, Hannah Giles. Strake added that his donations were made years ago and didn't have anything to do with the group's recent videotaping project. But he didn't rule out donating to them in the future. "I thought we were for transparency in government," Strake said. "They're public servants. If you don't want anybody to know about it, don't do it. That's my theory on that." Take a look at the foundations that have funded American Phoenix in the past, and their financial ties to other conservative organizations in Texas. Giles, who is now married to Basel, drew national headlines in 2009 when she and fellow conservative activist James O'Keefe entered the offices of the Association of Community Organizations for Reform Now, or ACORN — an activist group known for its voter registration drives — to ask for a housing loan to fund a brothel. Undercover video of their visits to ACORN offices across the country showed Giles dressed as a prostitute and O'Keefe appearing as a potential congressional candidate asking ACORN for advice from staff about how Giles could obtain a housing loan for an illegal operation. After the videos, ACORN lost funding from government agencies, and the group shut down. The New York Times later looked at the videos​ and determined they were heavily edited. The California attorney general, who looked into the matter after the two visited three California ACORN offices, issued a report that found no evidence of intent by ACORN employees to aid the couple. Strake said he was a fan of the videos because in 1982, during his unsuccessful campaign for Texas lieutenant governor, he was targeted by ACORN. "They are pretty rough and tough," Strake said of ACORN. "In '82, they shattered me everywhere I went." The Strake Foundation has also donated to the Empower Texans Foundation — which has an outsized influence among Republicans in the state Legislature, and calls Sandefer and conservative activist Michael Quinn Sullivan board members. George Strake has served on the board of the Texas Public Policy Foundation (TPPF), a conservative Austin-based think tank. Meanwhile, the Franklin Center funds Watchdog.org, a journalism network operating in nearly 20 states, including Texas. Sandefer's Ed Foundation is also a donor to conservative organizations including TPPF, Empower Texans and Empower Texans' related website, Agendawise. Sandefer is a Rick Perry donor and TPPF board member who made a fortune in the oil and gas industry. A former UT-Austin professor and Acton School of Business founder, Sandefer was a trusted higher education policy adviser to Perry, who called on Sandefer to help him vet potential regents. Sandefer has contributed $1.04 million to various candidates and causes in Texas since 2010, according to campaign finance reports filed with the Texas Ethics Commission. Some of his biggest beneficiaries were Texans for Rick Perry ($112,976), the tort reform group Texans for Lawsuit Reform ($85,000), former state lawmaker and current Attorney General Ken Paxton ($43,696) and Texans for Dan Patrick — the current lieutenant governor ($20,000). Sandefer has also given $420,000 to Accountability First — a PAC that has targeted House Speaker Joe Straus and his allies in Republican primaries — and $66,000 to the Empower Texans PAC. The list of Republican candidates he has supported for the Texas House includes Scott Turner, who challenged Straus for the House speakership this year and received $115,000 in contributions from Sandefer. Requests for comment made to a Perry spokesman, the Franklin Center and Sandefer were not immediately returned. Caroline Espinosa, a spokeswoman for the TPPF, said Thursday that the issue "doesn’t really involve us, so we just don’t have any comment on it." Michael Quinn Sullivan, Empower Texans' president and CEO, could not be reached for comment. American Phoenix has been recording the doings of Texas lawmakers since December, and one group leader has said the footage will show Texas lawmakers confessing to a variety of indiscretions. But state Rep. Jason Villalba, R-Dallas, said it was too soon to implicate anyone in the group's activities until more recent financial records are available. And even then, he said it would be hard to know whether donors gave with the knowledge that their money would be used to secretly film lawmakers. He also noted that a few years ago, there was widespread support among conservatives for organizations like American Phoenix, which were viewed as a way to combat bias in the mainstream media. "We were all talking about how this was the way we would have a counter-response to what many conservatives call the liberal media. Now that this media focus is being used against — at least being perceived to be used against — our own, I think we are less confident in the nature of what they are trying to achieve." Reporters Morgan Smith, Ross Ramsey and Patrick Svitek contributed to this report. Disclosure: The Texas Public Policy Foundation is a corporate sponsor of The Texas Tribune. A complete list of Tribune donors and sponsors can be viewed here.